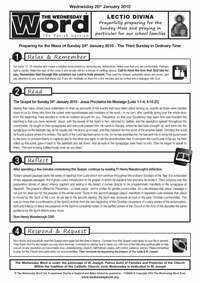 The Parish Church Version of The Wednesday Word contains this Sunday's Gospel and is updated every Monday for parents to download (please click here). Each week, Dom Henry Wansbrough provides a reflection on the Gospel (and also the first and second readings) to help you understand more of its meaning. The Wednesday Word is based on the Benedictine prayer custom of Lectio Divina – a powerful way to pray with and be enlightened through scripture. We hope that you find it spiritually uplifting. Many parishioners throughout the country use this parish version of The Wednesday Word each week to pray for the well-being of the families connected to our schools. This is used as a focus for prayer on Wednesday evenings (traditionally known as St Joseph's day; St Joseph is the Patron Saint of Families). In this way parishioners are in spiritual solidarity with each other and also with any school families who are participating in the primary school Family Time together. The Gospel can sometimes be complex and appear to have many meanings. It's possible to misunderstand scripture and even take it out of context. God helps us to understand the Gospel through the homilies preached at Sunday Mass. "Where two or three come together in my name, there I am with them"